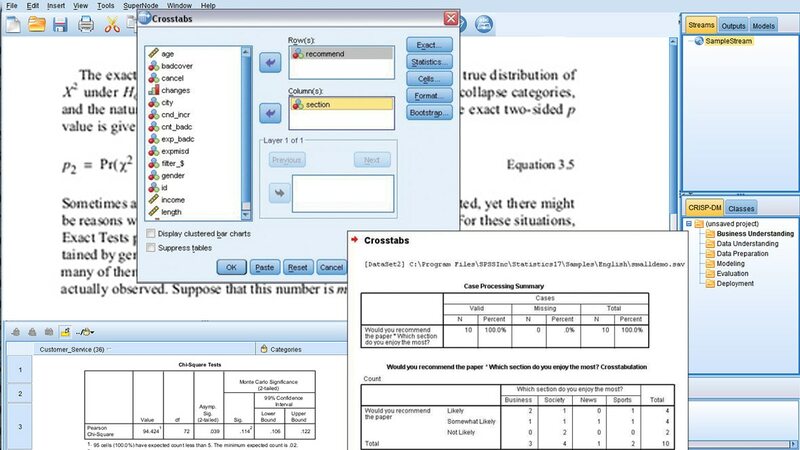 IBM SPSS Exact Tests is a fully integrated module of IBM SPSS Statistics. The software enables you to analyze rare occurrences in large databases or work more accurately with small samples. With more than 30 exact tests, you’ll be able to analyze your data where traditional tests fail. If you have a small number of case variables with a high percentage of responses in one category, or have to subset your data into fine breakdowns, traditional tests could be incorrect. SPSS Exact Tests eliminates this risk. It operates on Windows, Mac and Linux platforms and is available as client-only software or as a client/server installation. All it takes is just the click of a button to run a test. The tests cover the entire spectrum of nonparametric and categorical data problems for small or large data sets, contingency tables and on measures of association. Slice and dice your data with greater freedom. You aren't limited by required expected counts of five or more per cell for correct results. Explore within large data sets for rare occurrences or use SPSS Exact Tests for subsetting your data into fine breakdowns. For example, retain natural categories of regions, income or age groups – and analyze what you intended to analyze.